Home / Reviews / Suspiria (2018) What Year Is It? 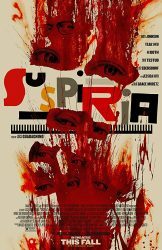 I am not quite sure what to make of Suspiria. [Here is link to Matt’s review of the original] On one hand, I found myself nodding off multiple times during the two hour and thirty-two minute run-time. On the other hand, it features scantily clad ballet dancers and witches. On another hand, Dakota Johnson continues to display the acting range of a doorstop. On the fourth hand, there is a brutal scene featuring a helpless woman being contorted into a ballpark pretzel.